I've always wished that I had more domestic talents. I wish I could sew, but just don't have the patience. My mom helped me sew a nursing cover a few months back and it was all I could do to do something basic like that. I wish I could say I liked it or that I had some knack for it like my friend Camille. (You have to check out her stuff, it's beautiful) I also wish I had a great taste for decorating or crafting, but it's just not there. I do like to cook and love my slow cooker. I also like trying new recipes that aren't too time consuming or difficult but that taste yummy. Last week we had an enrichment on bread making. A local company named Pantry Secrets came to present. They have an incredible recipe that works good for tons of stuff. The nice thing too - it's super cost effective. Costs about 25 cents a loaf to make. And you can make it from start to finish in an hour. 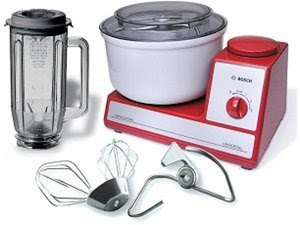 My mom has a Bosch mixer and I'm seriously wishing I had one - much like this beautiful one you see pictured below. Never thought I would think a mixer was beautiful 10 years ago. Funny how things change when you get married and have a family. Guess I will save my pennies. I've had to make everything by hand so far, but at least I"m getting some arm muscles kneading the bread. Chandler loves homemade bread as my mom makes it a lot (I think her recipe is a little different), so it's nice to be able to make it. So far here's what I've made from the same recipe: Bread, Cinnamon Rolls, Stuffed Crust Pizza (cost all of $3.50 to make it), breadsticks, cream cheese braid, and scones (navajo tacos). There are tons of other things that I want to make from this bread recipe, and they gave us lots of ideas. It's definitely something I am going to stick with and I'm sure it will save us tons of money in the long run! My bread :) Isn't it pretty? I'm thinking you need to share this recipe! Very impressive!! I am not a realy "home-makery" person either...I am impressed with the pizza! My idea of home-made pizza is Papa Murpheys take-and-bake!! I'm impressed! I'm so sad I missed that enrichment, because I really wanted to go. I would LOVE the recipe! I can't believe you made all those yummy things. You are a lot better cook than me! I'm sure your family is enjoying your new recipies! Hey that's great! Can I get the recipe too!! Hey now you have my mouth watering and you didn't even post the recipe! I have tried making bread 10 times within the last few months and NONE of them turn out! I really want a bosch too. Your bread is amazing! do you have to use dough enhancer? We find out what we are having on the 13th. I had to wait like 3 weeks past my 20 week mark. Lame huh? Hope your enjoying Utah! Hey there! I have yet to be able to make home made bread! I cheat with rhoades! Ha! I bet yours tastes much better. Hey you! Your boys are getting so big! I have decided to start making bread to, but that's about it. I should really follow through and ask my mom to teach me. Your bread looks great! Hopefully my first time turns out that good! Mmm that pizza looks yummy! That is awesome that you have learned how to do that! You MADE those? I hate you. Seriously.